Club Penguin Cheats by Mimo777 Club Penguin Cheats by Mimo777: Club Penguin Cadence & Penguin Band Comment Tracker! Club Penguin Cadence & Penguin Band Comment Tracker! Saweet! Cadence has been spotted at the Music Jam with a NEW background! The Penguin Band is playing at the Iceberg, but when they take a break, look for them at the Backstage! You will then be able to get their backgrounds. I sure hope they have a new background too! So, let's use the Mimo Comments tracker to find famous penguins! We always have a lot of great response to our Comment Tracker! You like it, you request it and it works! So here are a few new things that will help us all find famous penguins! 8. So, if you see a famous penguin, post a comment here that says who they are and what server they are on. Let's not post comments here about any other subject! There will be other posts coming for that! Cool? If you have any other helpful hints let me know! Let's go find some famous penguins! Mimo posted this when I was on! I told mimo to post it! War is the FYI pin??? Cadence is on Alaska at Dance Lounge! If you throw a snowball in the Casa Fiesta, it turns into confetti. SO COOL! 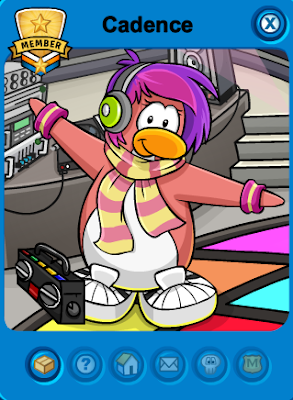 GUYS cadence was on Beanie rooftop!GO now! The T-shirt with guitar thing glitches so that the shirt looks all wierd. guys! this is getting annoying. the penguin band at the ice berg is not them! they don't give u background! Hey mimo I hope I find some famous penguins!By the way if you got to back stage and on the tv pictures will pop up. SHE IS ON A FRENCH SERVER!!! I MET HER I GOT HER AWESOME BACKGROUND!!! They don't give a background because they are just "robots". I Met Cadence Today Yay And I Got Her New Background! Cadence is on YUKON in the casa fiesta room !!!!! canade at sleet backstage night club top. I have just noticed that the candy pin is back! Anyone seen a famous penguin yet? Guys, its really annoying when you say PB at iceburg or where Cadence ISN'T. We want to know where she IS. Please Stop. I've seen Cadence 3 times today! So unfair! Ive been on cp for 4 hours and i havent seen her! OMG. look for cadence on the french servers! i found her on my first server! i was like wow!! its amazing try it! because there are less servers. I got a Glitch for u. Ok, u know when u put on the consession stand T-Shirts with a guitar on u can play it well at the very beging the T-Shirt throws a snowball! C NORTH POLE SKI VILLAGE!!!!! That is the same thing with me! Candence just left! :( Boohoo! Sorry but I can't tell you where anybody is because I amm a non-member. But everyone who has Is awsome! i want to find won! i saw rocky at the cove on christmas, he just got there so he might stay a while! I have been trying to find and get penguin band and cadneces background since last year!!!! the candy apple pin is back at the cave! Where is Penguin Band do they have a new background? BTW I found candence look in the French servers in the nightclub rooftop and Casa Fiesta. Just saying that the Club Penguin Band is always at the Iceberg. If you're looking for them you have to try Backstage. You can get Backstage from the Dock. can cadence only be on the night club roof? Dear Anonymous pleaaaaaaaase no caps! "Cadence Is on Big Surf On Rooftop!" plz tell me where c is i have been tryin to find her since last year! Can one of the famous penguins(like Rockhopper, Candace, and Gary) be on a ...... say a French server and also on a English server at the same time? does anyone know what time the penguin band go on break? Mimo the candy apple pin is back!! it must have been a glitch or something!! The best thing to do is to see the most recent post(usually at the bottom; it also helps to check the time it was posted) and go to the place it mentions. You can also try going to places she most often visits- look at the comments to find the places she visits most frequently. Keep changing servers and don't give up! I haven't found any famous penguins yet, but I am still looking! Mimo! I found something cool! On the homepage, when you click the starfish, it changes to a clam shell, then a snow castle, and then it turns back into a starfish! if they say where the famous penguin might be! Cadence was on Mammoth rooftop mins ago, she might still be there, but not only the dance lounge and rooftop are now full, but the whole server. Who is rocky? Oh, is it Rockhopper? And also to Lovepingi - Did you really?! this is not a questing area this is a comment tracker sheesh! DOES CANDICE AND CP BAND ONLY GO TO MEMBER ROOMS?? French server- Yeti- Casta Feiesta! GO GO GO! No,She can be at the nightclub inside,upstairs and roof. That is actually is a fake penguin band,they're always at the ice berg playing instruments and everything,they dont even give you backgrounds,but look for them when they're taking a break in backstage!. Anonymous, Make it easier and say C instead of Cadence. It shortens comments and it's easier ok? I can't find Cadence! Please help, I'm only a member for one more day! I soooo want the band background ... the coolest and the most rare background ( or maybe gary and arctic is more rare) but i still LOVE It! Have you read Mimo's Rules? Please do for it says not to use to many question marks! and you are using to many! Try to cut down on question marks ok? P.S when i say CPG MOD i am not shouting. i just saw candence on slushy ski village. SHE SAID LOL! LOL! tell me where the penguin band is when you find then plz, i want there background. SHES AT SLEET ON ROOFTOP! HURRY AND GET THE NEW BACKGROUND NOW!! cadence is on christmas rooftop!!!! Hey don't worry! You don't have to ask to be a mod! All you have to do is start asnwering people's questions! Then just put your name... and (CPG MOD) next to it. Then after awhile, Mimo will put you on his mod list. Good luck! Yeah, that's what she did when I met her too. :-D She rocks. i just C on beanie about 3 mins ago she might still be there! Yeah I bet it was a lot of fun for you and other penguins too! Waddle on and have some fun!! I need PB's back ground ! I can't seem to find the clubpenguin band anywhere have anyone seen them on a break? Cadence is at Yukon on the rooftop! Be there or be weird! By the way people, it's pronounced Kay-dence! They only give backrounds out when they're on break so if they're not at the iceberg lookaround. Mimo or anyone else, please tell me something! Everyone is saying 'Get off the metal, Cadence is under there!' Is it true? If everybody is off the metal dance floor on the rooftop, will Cadence come? I've been looking everywhere and i cant seem to figure out where candence or the penguin band any where! YAY!! I'm so happy, thanks to one of you(you were anonymous), I found Cadence, she gave me this cool background, I'm so happy, thanks mimo! I think only Candice goes into a member room!! The room is Night club roof (Only at music jam and you need a pass to get in!) But because I have never met PB (Penguin Band) I dont know if Penguin Band go into a member room... I think no.... I hope that answers your question! P.S By CPG Mod I mean im wanting to be a CPG Mod!!! You know whats weird? Every time I find a famous penguin, one of my friends is on that server. It dosen't matter if your on or off the metal, a lot of people say she only comes when your off it but it dosen't matter. And be sure to check the Casa Fiesta as she is often there too. Mimo didn't u say no trackers were part of the not to do list on CP ur breaking the rules!! PENGUIN BAND ARE ALWAYS PLAYING INSTRUMENTS! I CANT GET THEIR AUTOGRAPH! PLEASE TELL ME HOW TO! Your're not able to meet the penguin band and get their background while they're on the iceberg. You have to wait until the penguin band take a break and appear backstage on certain servers. Where are Penguin Band? What server are they on so I can get their autograph! Not true. This tracker doesn't use third party technology, it just tracks via the comments real ppl put thru. Yes, trackers are against the rules. But trackers that aren't updated, lets say, by hand. This is a COMMENT tracker. For example, saying that you found Cadence and you posted it on your blog. It is like that. This isn't as much as a tracker. This is much like a Chat window. So see, not against the rules. I have a Club penguin Cheats site too and people think im a fake because i've never met a famous penguin however hard I try and I was wondering if you could help me. Technically, the Penguin Band at the Ice Berg isn't real. They're "robots" which means they can't interact with the penguins. ok i have a question...when we go to the ice berg we see the band there right??? So if we wannna meet them we must go first to the iceberg and see if they are there...If they aren`t that means they may be on some server and so we have a chance to find them??? Ive only met rockhopper and I watch'd almost all your videos there awsome! Well pretty pointless but awsome! Cadence on yukon! Rooftop! Rooms full but trying my best to get in! ill never be able to meet c :( anyone know where she might be? anyone found cadence? i have been looking day and night please post if you have found her. Hey MIMO777 did u no the black things in the floor piano where the pools suppust to be are not working? This year has the penguin band ever been of stage ?? what happens if u meet the penguin band? ?to you get a backround or a free item?? Hi Sammy! This is just a rumor. It is NOT TRUE. Club Penguin confirmed this last year in a comment someone sent on their blog. Please spread the news! And if you ever get annoyed by people saying 'GET OFF THE METAL!' you can just go to a portugese or spanish server. I did that once, and since I don't speak spanish, I didn't know they were probably saying 'GET OFF THE METAL!'. Welcome! Ice, they are not fake. The penguin band playing at the iceburg IS the real penguin band. When they are NOT playing there or at Pizza Shop, you can meet them. I haven't met them, so I'm not sure, but I've met penguins who have met them, and I think all you get is the signed backgroud. btw... bb for billybob k? I don't think so. I think that Cadence, besides being famous, is just another penguin and can't do anything we couldn't do. So I would say no, she isn't under the metal. Does candence ever show up on places where all members can see her? Or is it just the "all acuess pass" places that she can visit? Im not a member but I've benn playing clubpenguin ever since it came out. I've always wanted to meet her...but Im not a member. EXACTLY! There is still someone on her account so she wont be able to land a jetpack or come out of the floor because the metal supposedly 'lifts up.' She cant be a computer because that is crazy. People just make up rumors like that and llie and say they saw it. Thatis NOT true. And i dont think a computer would run everywhere crazy screaming ATTACK and LOLZ! That is what Cadence did once. Lolz! Just a rumor. That will OBVIOUSLY not work because there is someone on her account. shes just a normal penguin except shes famous. she wont be able to come from below the metal after it "lifts up" or land her jetpack. since when does cadence have a jetpack? Below the metal is the dance lounge. just a rumor! No need to worry! Hope this helped out. Dont believe those rumors. Are the club penguin band members going to be giving free backgrounds or just Candance ?